At the close of Turkey’s second trial hearing against US pastor Andrew Brunson, his lawyer has sharply protested the Izmir court’s reliance on secret prosecution witnesses against his client. Jailed for the past 19 months, the 50-year-old Evangelical Presbyterian minister was sent back to his cell in a maximum-security prison for another 10 weeks, until the third hearing set for 18 July. “This secret witness issue is absolutely outlandish. It is not just related to our case; the secret witness issue has a very serious problem,” his lawyer, Ismail Cem Halavurt, told a Deutsche Welle reporter after the hearing. “This case cannot proceed by just relying on secret witnesses’ testimony,” Halavurt said. “There is not a single piece of evidence,” he added, referring to the latest sensational allegations thrown against his client just that morning by a secret witness called ‘Serhat’. The witness claimed Brunson was plotting to set up a Kurdish Christian state, helping transfer US weapons to a Kurdish militia in Syria with his “missionary team”, and collaborating with well-known supporters of Fethullah Gülen, the Muslim cleric Turkey has demanded be extradited by the US in exchange for Brunson. “Brunson’s release was obligatory, but unfortunately today [7 May] his release did not happen,” Halavurt said, vowing to file the necessary petitions before the third hearing “so this illegal detention will be brought to an end”. “We will struggle to get Brunson set free,” he added. The lawyer told reporters he had listened to Turkish Foreign Minister Mevlüt Çavuşoğlu’s comments about Brunson’s case just hours before the second hearing began. The lawyer said he would persist in demanding Brunson’s legal right to be released from custody for the duration of the trial, expressing concern that the court’s refusal has caused the pastor serious psychological distress. During the 10-hour hearing on Monday, 7 May, the prosecution presented two secret witnesses who testified via video linkage, with their faces blurred on huge overhead screens and voices altered. Another five witnesses testified openly in person in the courtroom. At the outset of the hearing, the presiding judge noted that missionary activity is in fact legal in Turkey. But the prosecution witness testimony revealed each individual’s distrust of ‘hidden’ motives behind Brunson’s Christian activities, which they linked to his alleged involvements with Kurdish terrorism and the now-banned Islamic network of the Fethullah Gülen movement, accused by Ankara of launching the failed 15 July, 2016 coup to overthrow President Recep Tayyip Erdoğan’s government. For nearly two rambling hours, the secret witness referred to as ‘Serhat’ recounted events and activities in which he claimed Brunson was involved. Although he described himself as a Christian, Serhat admitted repeatedly that he had not himself heard or witnessed the claims he was relating. Rather, he had “seen social-media accounts” displaying the sympathies of some people attending the church for the illegal Kurdistan Workers’ Party (PKK), or been told things by various sources. As coordinator of the ‘religious arm’ of the PKK, Serhat said, Brunson was arranging the transfer of arms being sent by the US to the Kurdish PYD (Democratic Union Party) affiliates of the PKK. “I learned this from the son of a diplomat who had worked for years at the US Embassy [in Ankara],” Serhat claimed. Saying Brunson talked about forming a new state and preparing for a great war, Serhat claimed he had chosen a “Kurdish pastor” for south eastern Turkey who was working among the Syrian refugees to establish Kurdish Christians in all 81 provinces of Turkey. The presiding judge sharply reproved Brunson’s demand for evidence, declaring that physical proof, such as photographs or documents, was not required for the court to decide what was credible evidence. Brunson declared that he had never seen or met the first three open witnesses, two of whom were prisoners brought from jail under guard to testify. 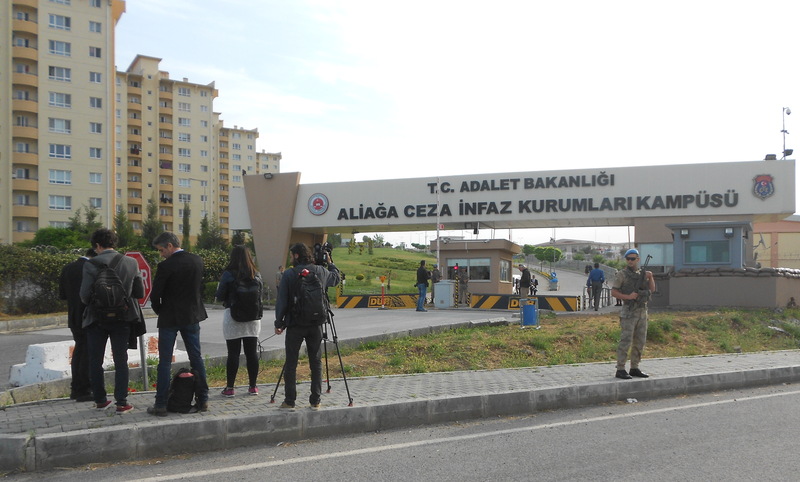 One of them, Ali Daloğlu, claimed he had observed Brunson three times along the Turkish border when the pastor was going back and forth between Suruç, Gaziantep and Şanliurfa, involved with Syrian Kurds. He also said he had seen Brunson meeting in a hotel in Gaziantep with an active Gülenist, who he said was giving the pastor financial aid for Syrian refugees. Brunson flatly denied ever seeing or knowing Daloğlu or any of the four Gülenist suspects he had named, declaring his testimony “disgusting”. 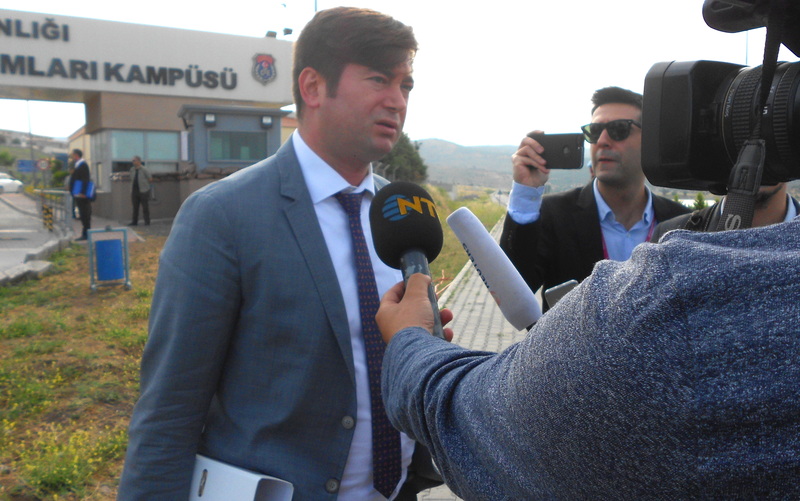 When Halavurt was invited to cross-examine Daloğlu, the lawyer quoted from research documents he handed over to the court, revealing that Daloğlu had an ongoing prison record of 14 arrests for automobile thievery. The last two witnesses were personal acquaintances known to Brunson. A young man living near a building Brunson referred to as a house of prayer testified he had seen many foreign visitors coming and going, and had “heard” from Turks who attended another Protestant church that the pastor was supporting PKK propaganda. 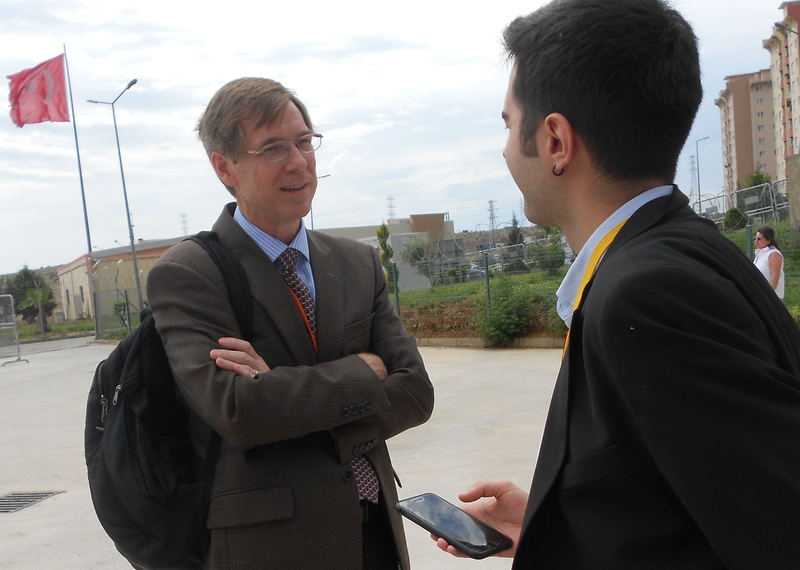 The Brunson family’s pastor, Richard White from North Carolina (left), outside the Sakran Prison complex before the hearing for Andrew Brunson began, 7 May 2018. The last prosecution witness named Eyüp Çakir said he had known Brunson for six years and regularly attended his church for some time, but then became uncomfortable about the influx and active involvement of Kurds in the church leadership and worship, which he considered a “provocation” among the Turkish congregation. “I responded to all these false charges in the first hearing of this trial,” Brunson continued. “I want to say clearly, the PKK is a terrorist organisation. I never thought differently.” Çakir admitted on the witness stand that a friend had helped him open a fake Facebook page, on which he began posting pro-terrorist items, posing as a PKK supporter to befriend Kurdish refugees and gather information against the pastor, vowing to Brunson: “I will destroy your PKK church.” The pastor said he told Çakir, “You are the most dangerous person in our church,” and refused to accept him back into the church. At the close of the hearing, the 20 local observers seated with Brunson’s wife at the back of the courtroom were clearly disappointed with the judge’s ruling to decline the pastor’s request to be sent home under house arrest. And they were shocked to learn that the judicial panel had rejected seven of the 10 defence witnesses prepared to testify on Brunson’s behalf at the next hearing, because their names appear in the indictment. The closing paragraph of the indictment lists more than 60 individuals or organisations named throughout the document, declaring them all “suspects” because of witness allegations that they were associated with Andrew Brunson and his activities. Halavurt told World Watch Monitor he is filing a formal protest over the exclusion of these key witnesses from his defence portfolio. Representing the US Commission on International Religious Freedom, which has publicly campaigned for Brunson’s release as the innocent victim of false criminal charges, Vice Chair Sandra Jolley came from Washington to observe the trial. She was joined by Charge d’affaires Philip Kosnett and several consular officials from the US Embassy in Ankara. Brunson’s US-based pastor Richard White also flew from North Carolina to attend the hearing. When he returned home, he reportedly told his congregation (which includes Brunson’s parents) that he was “sad, angry, and resolute” after watching the proceedings. This week the American Center for Law and Justice, leading US advocacy efforts for Brunson, confirmed that the UN Working Group on Arbitrary Detention has taken up his case. Accordingly, before the first trial hearing on 17 April, this independent panel of international human rights experts sent an official inquiry to the Turkish government, requesting that it refute within 60 days the allegations that Brunson’s detention is arbitrary.